We were told that last night’s service was a gift to St. Paul’s, though it was not clear from whom or why. Did the musicians pay their own way to Pittsburgh so they could sell a few CDs? It seemed churlish to ask last night, but enquiring minds would like to know. Asking around, I have yet to find a justification for the use of the word “gift.” The vestry has apparently spent $4,000 from the Education Fund on the Refuge/Wilderness project. $1,000 was used to send Kris to Denver to check out The Wilderness. The remaining fee was a consulting fee to Kate Eaton. I might have questioned Eaton more aggressively had I know that we had paid her $3,000 to be at St. Paul’s. Travel expenses for her and other musicians were apparently paid for from this fee. The view of a choir member during a 10:30 service differs from that of worshipers in the nave. As I have often done recently, I sat behind the organ console today, a place from which I can sometimes see things others do not. Also, as St. Paul’s’ former Audio-Visual Coördinator, I think about things others do not. Today, I seemed to have a lot to think about. The church was hot today. I don’t know how long the air conditioning units had been running, but it wasn’t long enough. Doug Starr had them turned off about 10 o’clock, when the choir and soloists began a rehearsal in the church. That was necessary, of course, but it probably would have been less of a problem had the units been running longer or set to a lower temperature. Many choir members thought that today was the first Sunday we would not wear our robes, but Doug said that that would be next Sunday. It was warm with my robe on, even wearing a short-sleeve shirt. Just a few minutes into the Eucharistic Prayer, I heard a crash behind me. I looked back and saw nothing particularly unusual. A few moments later, however, a number of people were rushing to minister to an acolyte who apparently had fainted in the heat. This happens every now and then, and I think the young man is all right. To keep out of the way, choir members took communion at the lower altar rail. Since shortly after Lou came to St. Paul’s, we stopped adjusting the lights in the church as the service proceeds. (We used to dim the house lights during the lessons and sermon and spotlight the pulpit, for example.) Now, however, we seem to keep the lights on as bright as possible for the whole service. Although I’m not sure that dimming the lights actually saves electricity, I do know that it diminishes the amount of heat the lights produce. A back-of-the-envelope calculation suggests that the lights in the church draw about five kilowatts of electricity. Much of that energy goes into heat, rather than light. I did notice that at least one bulb in a lantern at the crossing was burned out, which saved a little energy and diminished the heat production. As I was recessing along the south aisle, I also noticed that two lamps in the track lighting were out. My hymnal was a bit hard to read as I passed under those lamps. More burned-out lights that the congregation could not see are in the four panels that control the church lighting system. The system is controlled with pushbuttons, and the only way to tell what switches have been activated is to see which pushbuttons are illuminated. Many of the lamps that illuminate the buttons are burned out, so it’s hard to tell at a glance how the lights are set. The lamps, which look a bit like tiny Christmas tree lights, are a pain to replace, and I doubt that St. Paul’s is keeping replacements in stock. Some other problems with today’s service were more apparent to everyone. The prelude was a duet sung by Brian Brazon and Sarah Williams. These young people do not yet have strong adult voices and so were supplied with a microphone. I can’t say that it did much good. Two microphones would have been more appropriate, and the microphones should have been closer to the singers or the gain should have been set higher. I was closer to Miss Williams and could not really hear Mr. Brazon. I doubt that many others heard the duet properly. That was too bad. Finally, I was surprised that the Paschal Candle was still next to the pulpit this week. In the not-too-distant past, it was moved from its regular position near the font to near the pulpit for the Easter Vigil and was returned to its usual position after Pentecost. According to a prayer book rubric for the Easter Vigil, “It is customary that the Paschal Candle burn at all services from Easter Day through the Day of Pentecost.” I did notice that the candle was (properly) not lit today. The presence of the large candle stand, however, made using the nearby credence table cumbersome. I recently asked a parishioner to read a post I made here and was asked the question, “What is a blog?” That question caught me off-guard. It is likely, however, that even parishioners who are regular users of the Internet are not regular readers of blogs. Thus, I want to offer a few words of advice to help everyone take full advantage of St. Paul’s’ Epistle. For openers, you may want to read the introduction I wrote for this blog on April 12, 2010. You can do so here. General information about blogs—“blog” is a contraction of “Web log”—can be found on Wikipedia. St. Paul’s’ Epistle is a fairly typical blog, an expanding collection of personal essays on a single topic arranged in reverse chronological order and allowing for interaction among readers and between readers and author. Personal is important here. I am one parishioner at St. Paul’s and probably not a typical one. I will write about what seems interesting or important to me. If you find my musings entertaining or useful, do become a regular reader. If not, don’t. If you are familiar with reading blogs, you can probably skip this section. At the left on the home page, recent posts—each essay or entry is called a post—are displayed, with the most recent one on top. Above each essay is the date it was added to the blog and its title. On the home page itself, only posts are listed. Comments left by readers are not shown. To see a post on a page by itself that includes comments and links to pages that link to the post, click on the title of the post. At the right of each page are links to the most recent post being viewed and to a handful of earlier posts. Farther down the right side of the page are links to the Blog Archive. Here, you can select links to view particular posts or posts for an entire month or entire year. (Click on the triangles at the left or on particular entries to see just how the archive list works.) 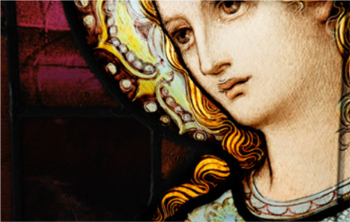 If you are not on the home page of St. Paul’s’ Epistle, you can click on “St. Paul’s’ Epistle” in the banner at the top of the page to go to the home page. Labels provide a means to find a particular post or posts on a given subject. Each page also has a toolbar at the very top that includes, among other things, a search box, which provides another way to search the blog. To leave a comment about a post, click on the link showing the number of comments or on the link labeled “Post a Comment.” Note that you must be registered to leave a comment. That registration can be in the form of a Google account or one of several other accounts, such as one from AIM (AOL Instant Messenger). If you have no such account, I suggest that you sign up for a Google account. There are few rules for comments, though I would ask that any comments be civil. Comments are limited to about 4,000 characters. Certain HTML constructs can be included in comments to create links, display words in italics, etc. If you don’t know HTML, don’t worry about it. There are some other items of interest at the right. There is some information about me and, under “My Blog List,” a display of blogs I generally follow, along with information on the most recent posts on those blogs. You can click on a blog name or the title of a post to go to that blog or post. Finally, there is the matter of keeping up with current posts on this or any other blog. You can, of course, periodically type in the address (URL) of the blog in the address bar of your browser. Better still is to bookmark the home page (i.e., http://www.stpaulsmtl.org/) or add it to your Favorites. (Firefox has bookmarks; Internet Explorer has favorites. They are the same thing, links to pages you want to find easily.) The help file of your browser can give you more information about bookmarks. An even better way of keeping current with blog posts is to use a syndication reader. Reader software uses so-called syndication feeds and lists posts of blogs you want to follow. The posts can be read in the reader or on the blog itself, linked from the reader. I use (and recommend) Google Reader, which you can access at http://reader.google.com. Explaining Google Reader or similar software is beyond the task I want to undertake here, but, if you read a lot of blogs, it is worth learning how to use it. Internet Explorer has a built-in reader, by the way. “A Special Evening of Worship and Conversation”—that was the title on Wednesday’s service booklet for the event that was intended to communicate the nature of Refuge@St. Paul’s, the Sunday evening service we are being told will be launched on September 12, 2010. (See my previous post here.) I was at the church last night, along with about 50 other people. I’m still mulling over the experience, but I want to offer some initial impressions and thoughts. After hearing Lou’s description of the setting used for The Wilderness at the Denver cathedral, I was skeptical that St. Paul’s could be transformed into the sort of environment created there. I was pleasantly surprised. The church was darkened, and candles were everywhere, particularly on the high altar and balcony railing. Large pieces of fabric hung in various places, some highlighted with spotlights. Red, patterned drapery attached to the pulpit canopy made the pulpit look like a Middle Eastern tent. What looked like a large white sheet was suspended from the organ chests below an east window that stood out from the surrounding darkness on a late-spring evening. A table behind the altar held burning incense. A projector painted images above the peak of the arch at the rear of the chancel. There were “stations” set up around the chancel sporting icons, more drapery, handwritten notes, and other paraphernalia. Musicians were positioned as at the 8:45 service, and the celebrant, Kris Opat, stood at the crossing for most of the service. The liturgy, which was printed in a service booklet, was both familiar and not. Generally, it mirrored the structure of a Rite II Eucharist, but, if the sentiment was often recognizable, the wording was not. According to the “Permissions” section at the back of the booklet, the text was drawn from (and modified from) a number of sources, including the Church of England and the International Commission on English in the Liturgy, a Roman Catholic organization. Lessons were taken from The Message, a contemporary paraphrase of the Bible. who leads us through the wilderness to a land prepared for us. as he traveled through lands hostile and friendly. becoming the way for all people. who leads us into truth and life. and God’s peace will reign for ever. Amen. Both this text and that of the “Declaration of Repentance” (i.e., the stand-in for the Confession of Sin) were described as “extensively modified,” in part, I suspect, to stress the “wilderness” theme of the Denver service. The Holy Communion part of the service, apparently by New Zealand Anglican theologian Bosco Peters, seemed more orthodox, though I did a double-take at “From your own being you sent Jesus among us, incarnate of the Holy Spirit and born of Mary our mother.” The elements were distributed in a completely conventional manner. All the music sung in the service was either written or arranged by Kate Eaton, who came from Denver, along with several other musicians. Although some of the music was unfamiliar (the psalm tune and Sanctus, for example), other pieces were reworkings of familiar hymns, such as “All Creatures of Our God and King.” The music was reproduced in the service booklet, though much of it was oddly typeset, making it difficult to read in the semi-darkness. The singing didn’t elicit much congregational participation, but it was not impossibly difficult, and one could imagine getting more people to sing over time. All of the music called for unison singing. Eaton was accompanied by piano, percussion, electronic keyboard, and cello. Mercifully, percussion was used sparingly—still too much for my taste—and the overall tone was of New Age or World Music, rather than that of a Baptist revival. There were several purely instrumental interludes, and I must say that I experienced some disappointment when the music stopped. The overall tone of the service was comfortable and contemplative. The lessons and liturgy were informal and contemporary without being ordinary or condescending. Mostly, the service did not feel radical or in any way scandalous. I could raise some theological quibbles, and probably would if all services at St. Paul’s followed the plan of Wednesday night’s service, but I didn’t find the experience a threat to Christianity (or even Anglicanism) as we know it. The music was pleasant and, at times, quite lovely. The absence of guitars, saxophones, and trumpets was a blessing. For myself, however, I would not give up part-singing of hymns for unison singing, no matter how sublime. The church was truly transformed, though I cannot predict if I would feel this way week after week. The candles certainly contributed to the effect, and the fabric hangings managed to make the familiar architecture seem less familiar. Personally, I could do without the incense, which leads to a constriction of my throat and makes singing difficult. When the event was over, I ran off to Wendy’s for a Frosty. The projected images were also somewhat problematic. They were generally rather indistinct and contributed only marginally to the ambiance. Of course, had they been projected onto a screen, I would have found them positively distracting. One black-and-white image was upsetting. Because only the tops of images could be seen on the wall, it appeared to be the head of a woman seemingly buried in the sand, something from a Bergman or Teshigahara movie, perhaps. Last night’s service was not an isolated event, and, because Lou intends it to be a prototype of Refuge@St. Paul’s, more scrutiny is indicated. My first thought as I approached the church from the elevator lobby was that the unattended candles on the table in the hallway were a fire hazard. When I entered the church, my anxiety increased. I could think of all sorts of unlikely events that might lead to tragedy. Candles burned in church should either be in well-thought-out and isolated locations—like votive candles in Roman Catholic churches—or they should be where they can be constantly monitored. The Mt. Lebanon fire marshal would not have been happy last night. We once nearly set the church on fire from candles at a Taizé service that used considerably fewer candles, so I don’t think my concern is either fanciful or petulant. Kate Eaton has a beautiful, unusually low contralto voice. (Significantly, her music was pitched surprisingly low.) She reminded me of any number of my favorite female singer-songwriters. She is also Episcopalian—she is married to the cathedral dean in Denver—and therefore has a sensibility seldom found in non-organist church musicians. It will not be easy to find her clone in Pittsburgh. And I do think that a female voice is more in keeping with the spirit of the service. At the risk of being accused of indulging in prejudices, I find a female voice more nurturing and less authoritarian than a male voice, Janis Joplin notwithstanding. On the other hand, I generally do not like any kind of soloist in a worship service, be they called cantors, song leaders, or whatever. Eaton’s singing, pleasing though it was, seemed more performance than worship. I might have felt differently had there been more congregational participation, and she did explain that, in Denver, music is fixed for a season, giving worshipers time to learn the songs. In fact, some of the music was not difficult to read, and Eaton avoided the sort of irregular rhythms that, at least for me, make most praise music difficult to sing—assuming that I had any desire to sing it in the first place. Anyway, the bottom line for St. Paul’s is whether we can get the sort of sensitive, talented musicians we heard last night. And, of course, what will it cost us? 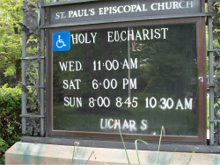 The diocese did give St. Paul’s seed money for Refuge@St. Paul’s, but, ultimately, parishioners are likely going to have to foot the bill for the new service. In the post-service talk, Eaton indicated that The Wilderness has attracted an increasing number of worshipers, has not diminished the size of other congregations, and has resulted in some—she did not say how many—new worshipers at more conventional services. She did not discuss the economics of The Wilderness, which was blessed with a generous pledge early on. Whatever qualms I might have about last night’s event, I have to admit that the service was interesting and engaging. It also was, as the rector promised, different. Nevertheless, I am skeptical that any service at St. Paul’s will attract people from all over town, as The Wilderness does in Denver. This is a city where, however irrational it might be, people are reluctant to cross the rivers. When we were regularly having Taizé services, they were poorly attended and, although having a visitor from some distance away was not unheard of, neither was it common. I would like to see the new service simply called Refuge. Refuge@St. Paul’s is rather too cute. (Why does everyone want to use an ampersand in lieu of “at” ever since e-mail was invented?) It is also somewhat self-congratulatory. If the service proves popular but the location does not, perhaps Refuge could move elsewhere, maybe even at our own cathedral. I must say that I am distressed that last night’s service seems not to have been about showing parishioners what they might want to have. It was showing them what we will have irrespective of how they feel about it. This is how our 8:30 (now 8:45) service came about. Significantly, when we had two principal Sunday services in the past and the early service was promoted as a “family” service, most people attended the early service. The family-friendly aspects of the service were that it was early and short. (The now defunct Canterbury Choir may also have been a draw.) The service was otherwise quite conventional. The longer, later service with adult choir and longer sermons experienced declining attendance. Now, however, our early “family” service, with its non-traditional liturgy and band, seems to be driving more and more people to the 10:30 service. 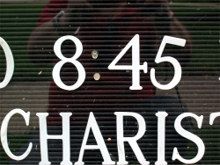 And, in spite of poor attendance, the 8:45 service has not changed. Can we expect St. Paul’s to drop Refuge@St. Paul’s if it flops? I fear not. One final quibble about last night. The predicted high temperature yesterday was 87°F. Why is it that no one thought of turning on the air conditioning early in the day to cool the church? It was insufferably hot during the service, no doubt exacerbated by the boatload of burning candles. That was another reason to go after that Frosty. It was announced today that a Refuge service will be held in the church Wednesday evening at 7 o’clock. This will be a kind of dry run for the Sunday evening service Lou is planning to begin in the fall. The service is based on The Wilderness, a program of St. John’s Cathedral in Denver, where Lou’s son Bret is on the staff. Apparently, several musicians involved in The Wilderness are flying from Denver to put on Wednesday’s service. I don’t know who is footing the bill for this. What population is this program intended to serve? Is it reasonable to expect that people will come to St. Paul’s Sunday evening for such a service? Will such a service advance our mission, however you construe it, or detract from it? Will such a program increase our numbers or create competing constituencies within the parish? I hasten to add that I know the answers to none of these questions. I plan to be at the church Wednesday night looking for some answers. Update 5/24/2010: More information is available on the St. Paul’s Web site here. Be sure to read the information there if you are thinking of attending Wednesday. At the beginning of “Strength for the Journey,” an event downtown for diocesan leaders that I attended beginning at noonday Friday, it was announced that Lou was in the hospital. I was tempted to post information about this development when I returned home yesterday, but I didn’t have a lot of information, so I decided to wait to see what was said in church today. Apparently, Lou has had some sort of infection and ended up in the hospital Thursday. He came home yesterday. Kris, who has been keeping in touch with Lou, reported his condition at the 10:30 service today and was reasonably reassuring. I didn’t get a chance to have a personal conversation with him, however. Prayers for Lou are certainly in order. While eating breakfast before getting dressed for church this Pentecost Sunday, I discovered an appropriate YouTube video for today. It is of the choir of King’s College, Cambridge, singing “Come down, O Love divine,” hymn #516 in our hymnal. This is a hymn we will be singing at the 10:30 service this morning. This lovely hymn by Ralph Vaughn Williams is set to the oddly named tune “Down Ampney.” I have always wondered where that strange title came from. As it happens, it is the name of the English village where the composer was born in 1872. Our hymnal only offers three verses of the hymn. You will hear four in the video. The words of all four verses can be found at Oremus Hymnal. The text dates from the fourteenth century. It was translated into English by Richard Frederick Littledale, appearing in his People’s Hymnal of 1867. A blessed Pentecost to all! I brought Jane Little to church yesterday. Due to a long illness, she had not attended a service at St. Paul’s in over a year. (Happily, she has received communion a number of times from visitors from St. Paul’s, and she received the ministrations of an Episcopal priest, Jeff Murph, at UPMC St. Margaret, where he is chaplain.) Her illness has caused Jane to exchange her cane for a walker. Assisting a person in Jane’s situation helps one appreciate the challenges architecture can present to those of us with handicaps. In this brief post, I want to offer a few observations from yesterday. First, of course, our elevator is a blessing of incomparable worth. It would be helpful if the door to the parking lot nearest the elevator had an electric opener, however. I was there to open the door for Jane, but a handicapped person who could drive would have trouble opening the door while using a walker. Jane reports that the door to the handicap rest room is very difficult to open, although she did manage to accomplish the task without help. Perhaps the door closer could be adjusted to make it easier to enter. On the positive side, Jane found the rest room itself spacious and easy to use. She particularly appreciated the fact that, once inside, she had no other doors to manipulate. Oh, and Jane loved being back worshiping at St. Paul’s. 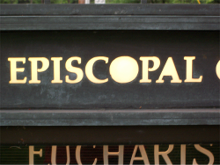 Progressive Episcopalians of Pittsburgh is sponsoring a program tomorrow night titled “A Conversation with Bishop Price.” This is a good time to meet Bishop Price and hear about his hopes for our diocese. 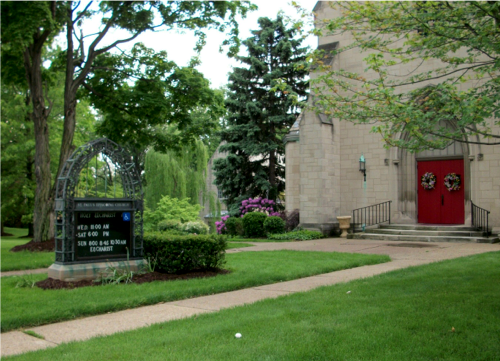 The program is being held at Church of the Redeemer in Squirrel Hill, 5700 Forbes Avenue, Monday, May 17, 2010, at 7:30 PM. Today was the last Sunday of Easter. Yet again, we sang no Easter hymns at the 10:30 service. Hymns were taken from the “Jesus Christ our Lord,” “Holy Eucharist,” “The Church’s Mission,” and “The Church” sections of the hymnal. “Holy Eucharist” was represented by three separate hymns. Next Sunday is Pentecost. Rather than sing an Easter anthem, the choir sang a Pentecost anthem by Thomas Tallis. Couldn’t we have waited a week? Of course, since St. Paul’s no longer seems to pay very careful attention to the church year, perhaps some of my favorite Easter hymns will show up during Pentecost. After all, we no longer perform baptisms on the traditional days; we do them for the convenience of the families involved. I guess it’s that welcoming thing again. For many months—I have no idea how long—the lamp that illuminates the text on our sign in front of the church has been out. If you pass the church heading south at night, you see “St. Paul’s Episcopal Church” illuminated at the top of the sign, and you can read the weekly worship schedule below it. If you’re traveling north, however, all you can read is “St. Paul’s Episcopal Church.” The area below is dark. I mentioned this to Lou at the same time I offered my ideas about coffee hour. (See “Coffee Hour.”) The sign is as dark today as it was then. Somewhere along the line, we seem to have concluded that our sign, a lovely custom sign, is (1) ineffective and (2) more trouble than it’s worth. We used to update it frequently, at least weekly. Now, we post the standard weekly schedule and leave it alone. If something special is happening, we either put up a tacky banner or do no advertising at all. Maybe it’s time to use some of that yellow tape we have around the Mayfair steps around our sign as well. Missing pieces of O and A. Do We Really Want to Repair the Steps? In a conversation with a friend yesterday, I happened to mention the deteriorated steps at the Mayfair Drive entrance to the narthex at St. Paul’s. My friend is not a parishioner but she is an Episcopalian who is familiar with our building. She also has mobility problems. I can’t recall the details of our discussion, but the upshot of it was that perhaps St. Paul’s doesn’t need to replace the steps but should build a handicapped access ramp to the sidewalk along Mayfair Drive instead. The most obvious advantage of such a plan is that it would provide more direct access to the church proper and allow a person in a wheelchair, say, to enter the church from the rear, a less conspicuous entrance (and perhaps a less embarrassing one) than through the transept door near the elevator lobby. Replacing the steps with a ramp might—I emphasize might—even save money. The steps, to be restored properly, should be constructed of limestone. The ramp could be poured concrete, a cheaper material, though one needed in greater quantity. Of course, any savings could be eaten up by the need to remove the current walkway and steps up to the Mayfair door. I don’t know enough about handicapped access, architecture, or construction to know if my idea is a viable one, but I do think it deserves some consideration. The ten thousand dollars we have talked about spending on a set of little-used steps might be put to better use by building a ramp. In any case, something should be done about the steps soon. In their current condition, cordoned off by yellow tape, they are hardly a welcoming sight and seem to send the message that St. Paul’s cares neither about its building nor about those who use it. 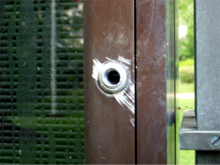 Some might conclude that our finances are so dire that we cannot afford to make repairs. We should ask if people would use such a ramp. It would certainly have the advantage of being a more conspicuous advertisement of our commitment to accessibility than the presence of our elevator. Of course, we wouldn’t want a ramp to mar the beauty of the building, but, being on the side of the church, I don’t think the ramp would be too jarring architecturally. Its obtrusiveness could be mitigated by plantings, which could actually beautify the site. The steepness of Mayfair Drive presents some problems. It is not the ideal place to get out of a car, especially if you have mobility problems. The sidewalk might have to be re-contoured to place a level slab at the bottom of the ramp. Would a straight ramp to the sidewalk have a sufficiently gentle angle? I’m not sure that it would. A curved ramp would be more complex and expensive. Perhaps access via a ramp and steps is indicated for the Mayfair narthex entrance. This is probably more of an aesthetic issue than a practical one, and it deserves consideration. It bothers me at least a little that the ramp would not allow easy access from the plaza directly in front of the main entrance. On the other hand, we might be able to design a ramp with a very gentle slope that connects with the plaza. Exiting a car on Washington Road is more convenient than on Mayfair, though traffic is a hazard. Does any sort of ramp seem reasonable? What do you think? The vocal group Believe (see picture) is presenting a concert at on Wednesday, May 12, 2012, at Christ United Methodist Church. 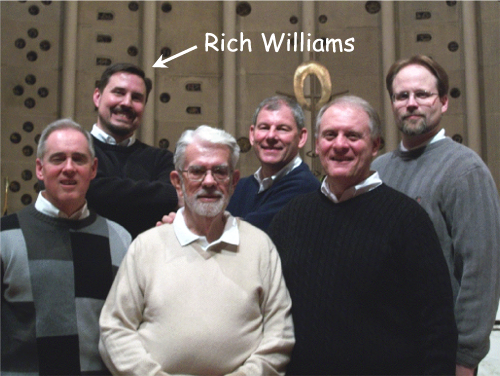 Perhaps you will recognize Rich Williams, a tenor in the St. Paul’s Chancel Choir and an occasional soloist in our church. Believe (well, most of it, anyway) has sung at one of the evening musical programs at St. Paul’s. The group, and its repertoire is a bit hard to characterize. Suffice it to say that they sing some barbershop, but they are not a barbershop group. They are, however, a lot of fun. As usual, we’re singing a wide variety of music. There’s something for everyone, including traditional barbershop, spirituals, patriotic anthems, sacred choral gems, and some just plain silliness. One of my favorites is a piece called “Lambscapes,” which uses four distinctly different musical styles to portray the story of Mary and her Little Lamb (plus we added a bit of choreography to really keep things fun). I dare you watch and listen to this and keep a straight face! Believe will be accompanied on by piano by Debbie Schneider. Christ United Methodist Church is above the Bethel Park Giant Eagle at 44 Highland Road. The concert starts at 7 PM. It was good to see an unusually large crowd at the coffee hour after the 10:30 service yesterday. I’m not sure why that was the case, and I doubt that the commissioning of Stephen ministers or the sheet cake celebrating the event was responsible. I enjoyed the cake, but I felt very uncomfortable in the crowd. Everyone is expected to pay for snacks. I have literally never been to any other church that has this expectation. We place what seems like a guard at the table, seemingly to assure that everyone pays. The food is placed on tables that block traffic and make it difficult to reach the food. Use the coffee hour for fellowship, not as a profit center. Move the tables out to the middle of the floor. Move other tables and chairs out of the way, so people can circulate freely. In particular, I noted that St. James’ holds their coffee hour—it really seems unfair to call it anything other than lunch—in a large parish hall. The tables holding the food are in a row in the center of the room, where they are accessible from all sides. All the other furniture is against the walls, so people can freely move about, not only near the food but throughout the room. And how does St. Paul’s arrange things? The food is on tables in the middle of the high-traffic path between the education wing and the Mayfair exit. After church, a traffic jam inevitably occurs in the hallway just outside the undercroft. Moreover, only one side of the tables are accessible by people seeking snacks. Several tables are set up just a few yards from the food tables, so that the crowd is corralled in a small area. This makes it difficult to get to the food, difficult to move through the area, and very uncomfortable for people who don’t like being confined in a small space with other people. Lou declared that he liked my idea of arranging the furniture for coffee hour the way we do for receptions, with excess tables and chairs moved out of the way and food tables in the middle of the space parallel to Mayfair Drive, rather than blocking the passage in front of the kitchen. He declared that we would try that arrangement the next Sunday. That was, as I said, months ago, and the suggestion still has not been implemented. When I was trying to leave the church yesterday, I had to walk around all the tables toward the back of the room, then walk back toward the hallway to the Mayfair exit. There were a lot of people I had to elbow out of the way. That makes an introvert like me very unhappy. Welcome to St. Paul’s, by the way, the most welcoming congregation in the world South Hills for all generations. One of the joys I find in church is singing hymns, and my favorite season for hymns is not Christmas but Easter. The Hymnal 1982 has 39 hymns under the heading “Christmas” and 40 hymns, most of them wonderful, labeled “Easter.” After all, Christmas is a late comer to the church year, but Christianity itself is inconceivable without Easter. And don’t assume the ones I left out are not also terrific, but some are a bit obscure. I don’t know who is choosing the hymns at St. Paul’s, but I, for one, am feeling cheated. I want to celebrate the resurrection!